Barakamon follows handsome young calligrapher Seishuu Handa as he moves to a small Japanese island after a falling out with the calligraphy community. However, Handa finds that rural life is not quite what it seems as he adjusts to his quirky but kindhearted new neighbours. Soon known as “Sensei” throughout the town, Handa quickly finds himself beginning to change as he learns to adapt to his new setting. Fans of slice-of-life series will find a lot to like here. Read this if you enjoyed series such as Silver Spoon and Bunny Drop. Handa is a wonderful protagonist and it is hilarious to witness his reactions as he adjusts to his new life and some of the outlandish situations he faces. This series is seriously heartwarming, delivering some poignant life lessons about perseverance and community. Chapter 7 featuring the Mochi competition was a favourite of mine as it really demonstrated some great character development on the part of Handa and a wonderful scene with the villagers. This series provides a peek at life in a rural Japanese village, which is highlight because of how different it is from the usual city-based settings of many other series. It was really neat to be able to see what life is like in a setting we don’t get to see a lot of. The artwork is clean and quite pleasant to look at, and the character designs are unique and memorable. No complaints here! The story doesn’t give a lot of indication on what direction it will be taking, preferring to show vignettes of Handa’s new life in the village. It’s not especially clear what the overarching plot will be, but it’s difficult to fault the story for this as a slice-of-life. Hopefully we will get to see some more of the bigger picture in future volumes. I really enjoyed the first volume of Barakamon and look forward to reading future volumes. The story provides a wonderful little tale of personal growth and community mixed in with some great fish out of water comedy. If you enjoy a laid back story which will deliver some laughs and some feels, you should definitely look at picking up Barakamon Vol. 1. It’s also worth noting that the print quality Yen Press has achieved is outstanding as the volume features over-sized pages and some neat inner cover design which are a nice touch. 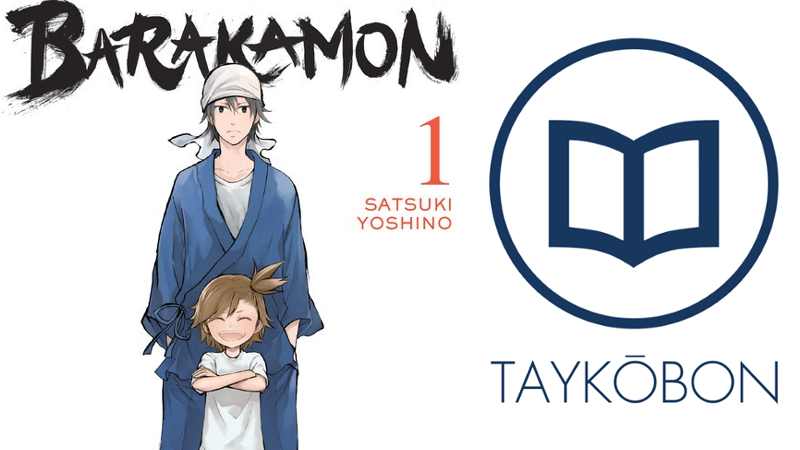 Barakamon Vol 1. was authored by Satsuki Yoshino and published by Yen Press on October 28, 2014. You can buy Barakamon at Amazon.com as well as most other booksellers. If you enjoyed this, you may enjoy my review of Nisekoi Vol 1. as well as Ani-TAY’s review of Barakamon’s anime adaption.